I'll confess, I was hugely skeptical. My experience with allegedly Christian math programs isn't good. A couple word problems that deal with multiplying fish or dividing sheep from goats. A couple of seemingly random Bible verses on the page. How does that make it Christian? I don't get it. I didn't expect much more from Principles of Mathematics, Book 1, to be honest. Because it is put out by MasterBooks, I was intrigued. But not really hopeful. I did something I never do. I requested a product, expecting that I was going to be writing a not-that-positive review. Katherine Loop has done the remarkable! She has written a solid math course with a truly Biblical worldview. This course goes way beyond the same old Christian math course that teaches math with a few Scriptures sprinkled in and maybe some church-based word problems. This course truly transforms the way we see math. Katherine makes the argument that math is not a neutral subject as most have come to believe. She carefully lays the foundation of how math points to our Creator, the God of the Bible. The nature of God, His Creation, and even the Gospel itself is seen through the study of math. Katherine does a marvelous job of revealing His Glory in this one-of-a-kind math course. 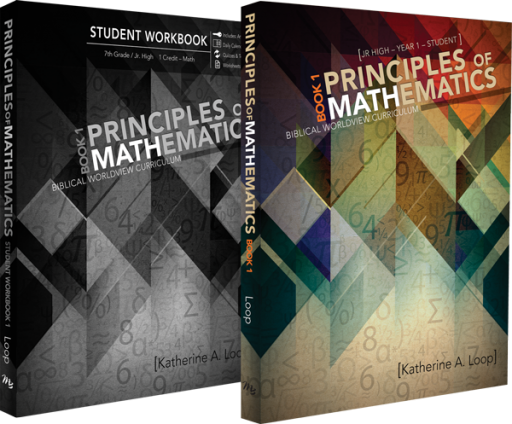 Katherine Loop's Principles of Mathematics Biblical Worldview Curriculum is a first of its kind. It takes math to a whole new level students and parents are going to love. It is a guaranteed faith grower! I ended up making both my 9th and 10th grader do this course. They are both beyond it, really, in some sense. But they also both need a bit more of the foundational concepts of math. They get the big picture pretty well, but they both struggle with details. What you get is an over 400-word textbook that contains the bulk of the course and can easily be used by multiple students. In addition, there is the student workbook, which is consumable. The text is split into 21 chapters, and each chapter is dividing into a number of individual sections. For a full one-year course, the idea is to usually be doing a section each day. Each section is a few pages of reading, often with some problems and examples being worked out. The workbook is 3-hole punched, which is handy. It includes two schedules for the text, worksheets for each section, quizzes for each chapter, tests for each quarter, a final exam, and the answer key. I love the schedules. The first has the student completing the material over the course of a 36-week year, and would be great for a middle school student. I plan to have my 6th grader start it that way in January. This has the student usually working through a section a day, but sometimes they read a section one day and do the worksheet the following day. Study days are also built into the schedule. The second schedule is to complete the material in a semester, and that is the schedule my high schoolers are following. Normally, they are working through a couple of sections in a day, and many of the study days are in addition to working in a section. Tests still get their own day and are not combined with any other work. This pace has been great for us. What about the content though? This does cover the general stuff you expect a pre-algebra course to cover. A review of basic operations, mental math, multi-digit multiplication and division, fractions, factors, decimals, ratios, proportions, and percents. At some point, depending on what you've used in elementary years, it starts introducing new concepts, such as negative numbers, sets, statistics, and graphing. Geometry, including distance, perimeter and area is covered. Then you get into things like exponents, square roots, scientific notation, before going back to more complex geometry like triangles, volume, angles, and a chapter called Congruent and Similar. The final chapter is a review. The material is covered in a conversational style that frequently addresses why in the world you would need to know this. I think that could help ME when we get to the geometry portion. I have a hard time grasping content unless I understand why I might care. That conversational style makes some complicated concepts a lot easier to understand too. She refers to math concepts as tools in a toolbox. Some tools like a basic screwdriver or addition are ones you will pull out all the time. Some tools are more specialized, and wonderful when you need them, but you aren't going to need them every week. Along those lines, I really loved that in the mental math section, she gives ideas, makes them use that particular technique... and then when reviewing mental math later, most of the time you are told to use whatever method you want to. What about the "Christian Worldview" aspect? I'm going to be blunt and say, "This course is not for everyone." My oldest two sons and I have just finished taking a live class using the Thinking Like a Christian materials put out by Summit Ministries. One huge point made in that class was that God created everything, and there is no such thing as a separation between secular and sacred. God is part of it all, and that applied to theology, biology, ethics, history, politics, law, psychology... everything. Our instructor never applied it to math, though. But math is part of everything, so that idea does still hold true. This book does that. God created a consistent universe, and holds it all together. That is why we are able to discover laws of nature and laws of math. We attach labels to these concepts, but ultimately, the only reason we can do things like memorize the fact that 2+3=5 is that God created that consistency in the first place. Two and three was five yesterday, it is five today, and tomorrow we aren't going to wake up and find that has changed either. The first two chapters of the book have a lot of discussion about this kind of thing, but it comes up in later chapters too. With the accelerated schedule, sometimes it feels like we're being hit over the head with the same general thing, and sometimes there have been some Bible verses thrown in that seem to be a bit of a stretch. Overall, though, we are loving it and absolutely planning to get Book 2 when we finish this one. Disclaimer: I received this book for free from Master Books. No other compensation was received. The fact that I received complimentary products does not guarantee a favorable review. Sounds interesting. We're along way off from these grades, but I find I'm often surprisingly impressed with the things from Master Books.